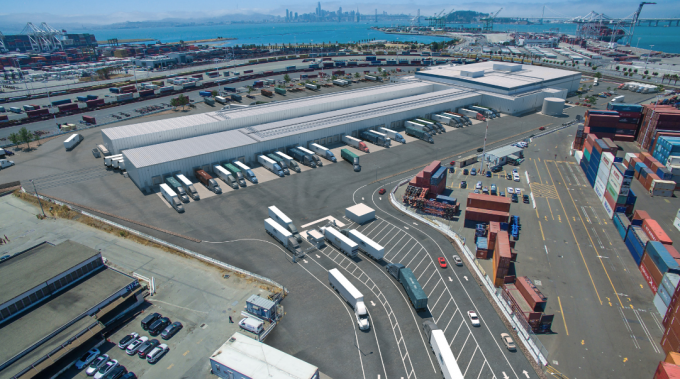 Although tariffs on US produce have hit exports to China, a new cold chain facility at the Californian port of Oakland is seeking perishables exports across the Pacific. Cold chain logistics providers Lineage Logistics and Dreisbach Enterprises have joined forces to set up a large cold chain facility at the port, which aims to be the hub for temperature-controlled cargo for northern California. The pair have described the facility, which came on stream on November 1, as a “game-changer” that sets a new standard in efficiency, food safety and speed. The venture has support from the port of Oakland and the state government, which both contributed funding. The former close to $15m, mostly for the development of a rail spur to the facility. Situated on a 25-acre site at the port, the venue consists of a 280,000 sq ft building with 20,000 pallet positions and a capacity to handle up to 1 million tons of perishables in a year. It has three blast cells and includes a 100,000 sq ft high-cube, multi-temperature storage environment. Besides frozen and refrigerated storage, import and export services and a facility for the US Food & Drug Administration, Cool Port supports truck cross-dock and rail transload operations, is equipped with 90 truck doors and can handle 36 rail cars in a day. Oakland is already a hub for perishables exports, especially frozen and chilled meat. “There are other cold storage facilities near, but not on port property. None nears the size of Cool Port,” said Mike Zampa, the port’s communications director. The operators stress the cost and time savings associated with having a cold storage facility at the port. “Many growers, packers and shippers like to load from their facilities to port, but the combination of distance and moving equipment around does allow for a facility that is close to a port and that can also handle the heavier loads,” said Chris Connell, senior vice-president, perishables North America at Commodity Forwarders, a Kuehne + Nagel company. “Cool Port is designed as a transfer hub for perishables – most notably chilled and frozen beef, pork and poultry. Cargo is shipped in rail cars from the US Midwest and would be transloaded and then sent across the street to load Asia-bound vessels. It eliminates the need for empty refrigerated equipment to be dropped at Midwest facilities for loading,” he continued. The operators have their sights firmly on Asian markets. “We’ll more efficiently connect US producers to Asian markets and in the process create hundreds of jobs in our own backyard,” said Jason Dreisbach, president of Dreisbach Enterprises. The greatest prize in that market, China, looks less promising at the moment, though, as the stand-off between Washington and Beijing has created hurdles for US perishables. In the six weeks after China implemented tariffs, exports of US table grapes fell about 40%, although China is ramping up imports of table grapes, apples and pears this year to compensate for a drop in domestic production owing to adverse weather conditions. Other perishables exports, from soy beans to lobster and seafood, have also been hit. According to Mr Zampa, Oakland’s export volume to China through September was 33% down on the previous year, which he attributed mostly to Chinese restrictions on waste paper imports. Agricultural traffic accounts for about half of the port’s exports by volume, he added. Leading commodities are dried fruits, nuts, meat and wine. The impact could be significant. When the port announced results for September (which produced new records in inbound traffic), it warned that tariffs could affect $2bn of imported goods.